My Paper Antics: Ready, Set, Go! Sometimes I feel like I'm running a marathon! Do you ever have that kind of day, week, month....? Kinda makes you want to shout, "Stop this train...I wanna get off!" That's sorta how I feel this week, well actually, the past month or two or three. It's all good stuff...but wow, I'd just like two days in a row where I wasn't rushing somewhere or to complete something. I probably wouldn't know what to do. Hmmm, maybe that would be good! I still haven't heard from my new follower Beth....she was my random pick for the weekly card set giveaway. Beth.....if you're out there....email me your address! After I get done here (and with the dusting, bed changes, vacuuming and garden watering) I'll be going down to The Studio to start creating your cards! 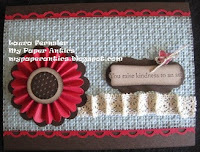 Today I'm going to share with you some projects I designed for Stampin' Up! events in 2010 and 2011. The photos are in a Facebook album, so it's easy to copy and post those here. The laptop I'm working from right now does not have an SD card ready, which means I can't take pics and load them. So, until I get a cable that lets me do that, I'll have to rely on past projects to tempt and delight you! I really miss my old laptop....it crashed one day, right while I was working on it. Oh my. That baby was deluxe piece of laptop, let me tell you. But it was old and pretty loaded down. It didn't just crash. It crashed and burned! We got this little laptop the day after Thanksgiving last year for $170, so that lets you know how "much" it has on it. We got it so I'd have a small laptop to travel with for internet access. My old one was HUGE! Anyway....'til I get a cable (or new laptop...hint, hint honey....I know he checks my blog out every now and then!) I'll pull out some of these old projects. I love this card. 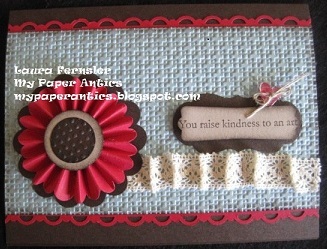 The stamped heart is a retired hostess set, probably one of my all-time favorites. This snowflake card is so warm and cozy; I know it sounds crazy, since it's snowflakes, but it makes me think of hot chocolate! 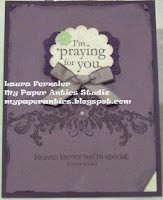 This card was almost a total CASE (Copy and Share Everything) from the Stampin' Up! Idea Book, I think last year. Now, it's been so long since I designed these, I could not tell you if I used another demonstrator's card as inspiration for my design. 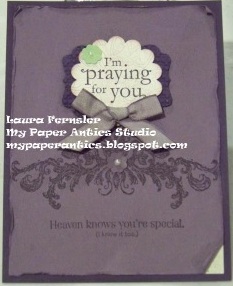 We have so many talented demonstrators in our Stampin' Up! family, I'm so thankful for those who freely share their creativity with us! Enjoy your day and I hope you find a little time for some creativity!